The space between the trees is not just space (although that’s important so that they have room to spread!). It usually gets filled with grass and weeds (unless you let animals in the orchard, which we don’t). What we have tried to do is to encourage a wildflower meadow which is attractive and encourages helpful insect life. By sowing yellow rattle, the vigour of the grasses is reduced and wildflowers have a chance of establishing. To maintain the meadow, it is important to mow it annually and allow the annual wildflowers (such as the yellow rattle) to seed. Having tried a number of methods, I have found that scything is the most pleasant and effective. 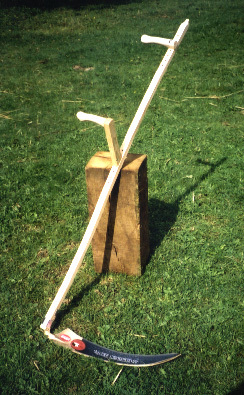 The important thing is to use a good quality Austrian scythe (such as one of these) and to keep it sharp. Then hardly any effort is required to slice through the meadow. It leaves nice large pieces (unlike a strimmer) which can easily be raked up.